Did you know that kids tend to have a higher risk of acquiring digestive health issues such as diarrhea and constipation, because of harmful bacteria? Don’t let me get started with the many things those curious hands get hold of, and unknowingly introduce to their yet very delicate gut. As parents, we do our best in nurturing them. But truth be told, our eyes can’t be on them 24/7. Even for someone who works from home, we can only, in fact, do so much. Because I’d rather be vigilant than sorry, I’ve always given our family daily doses of probiotics. While the benefits of Probiotics is a given, not all parents are aware of this. 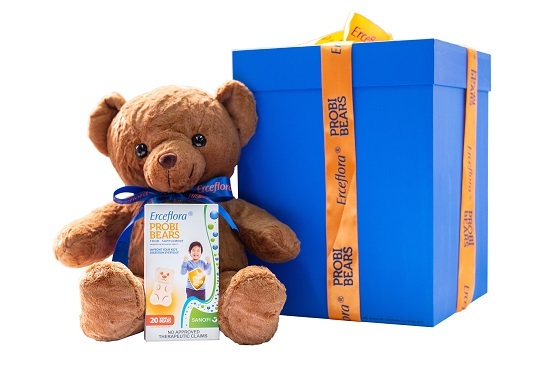 So when the Erceflora ProbiBears Care package arrived at our doorstep, I am only be too thrilled to let this great news out to fellow mommies. First off, What are Probiotics? A human digestive tract has about 100 trillion healthy bacteria. Bacteria aid in digestion and help the body defend itself against illness. Probiotics can aid with immunity and help protect you from common colds and flu. Every person, child or adult, needs a balance of good bacteria in the body. This balance is easily upset by a number of factors such as a poor diet, stress or by taking antibiotics and other medication. Sure, yoghurt contains probiotics. We totally believe in this. In fact, we make our homemade yoghurt on a daily basis. But truth remains that the amount, and the quality of probiotics in yogurt are not enough. Erceflora ProbiBears is the 2-in-1 Probiotic Supplement (Lactobacillus and Bifidobacterium) that will help improve your child’s digestion. Kids will love it because it comes in fun and yummy chewable bears! Erceflora ProbiBears will be available in Mercury Drug by June for only P540 SRP for every box of 20s.